Made from selected fresh papaya fruits extracted to produce the most effective way to whiten skin and eliminate bacteria that causes pimples and other skin blemishes. PAPAYA EXTRACT – Vitamins A & C (Exfoliant & Antioxidant). LAVENDER – Antibacterial properties to prevent pimples and other skin blemishes. VEGETABLE SOAP BASE – Vitamin E to moisturize and renew skin. Specially formulated to whiten dark spots on skin caused by acne, freckles and melasma.Guaranteed to give you a healthier, clearer, whiter, smoother and younger look. LEMON EXTRACT – Whitens dark spots caused by acne, freckles and melasma. A special formula that whitens and smoothen darkened and sun-damaged skin, moisturizes and softens ageing skin giving it a healthy, young and radiant look. Acne Treatment – The skin is cleansed and degreased of excess oil to clear away pimples and blemishes. 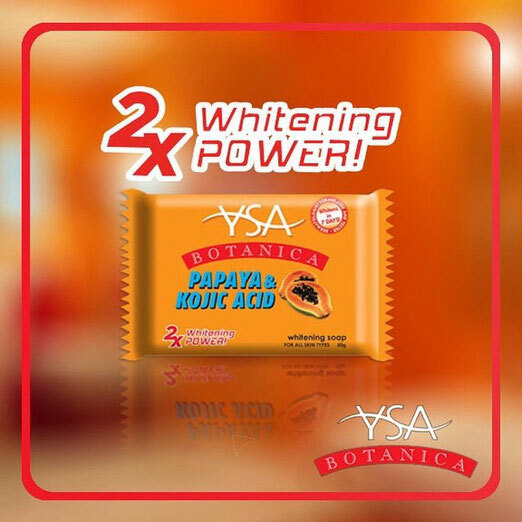 Whitening Potency – It gets rid of skin’s dark spots caused by pimples and blemishes with its potent papain from green papaya to effectively and evenly whiten the skin. Skin Protection – Added with Virgin Coconut Oil, it makes skin soft, smooth and protected from inflammation and irritation. GREEN PAPAYA – Its potent papain effectively and evenly whiten skin. It is especially formulated with Virgin Coconut Oil (VCO) that contains antibacterial property to protect the skin from inflammation as it leaves the skin soft and smooth. As a hypoallergenic soap, this product is highly recommended even to the most sensitive skin. Specially formulated for sensitive skin, containing natural ingredients to soothe skin irritation and inflammation. Glycerin - Moisturized and softens ageing skin. Contains fruity acid and tea tree oil to prevent the occurrence of whiteheads and blackheads. It reduces the secretion of excess oil which cannot be removed by ordinary soaps. Tea Tree Oil - Removes pimples, whiteheads, & blackheads. Uses geranium, carrot oil and fruit extracts to give skin its radiant and healthy glow maintaining a youthful look. Carrot Oil - Whitens and moisturizes skin. It contains synergistic active ingredients that regulate melanin skin pigmentation resulting to whiter and smoother complexion. Its active ingredients revitalize the skin for a whiter complexion. Its Papaya enzyme contains Vitamins A & C to effectively whiten skin through exfoliation, revealing a healthier, whiter & younger looking skin. YSA Botanica Whitening Facial Cleanser with Papaya Enzyme is formulated to exfoliate your skin by removing dead skin cells, whiteheads, blackheads and pimples as it whitens. YSA Botanica Antibacterial Facial Cleanser with Green Tea contains sebum control and antibacterial property to prevent production of pimples. It contains Green Tea Extract that protects the skin from irritation making your skin clean & relaxed. YSA Botanica Moisturizing Facial Cleanser with Cucumber Extract cleans and moisturizes, making your skin smooth, soft, and beautiful. An advance product that has premium skin lightening essentials, formulated by respected Dermatologist, to safely provide maximum results. This, it makes skin intensely lighter, smoother while restoring its youthful vibrancy. It lightens the skin tone evenly and naturally. Considered as the most powerful, versatile and important anti-oxidant produced by the human body. Reduced glutathione preserves and protects our bodies against the damage of free radicals. GlutaMAX capsules also contain 75mg of Sodium Ascorbate to increase resistance to ailments and reduce tiredness. GlutaMAX reduced glutathione works inside our body while GlutaMAX lightening soap works on the outside. With its combination, GlutaMAX can give us a beautiful, youthful looking skin while keeping you healthy within.